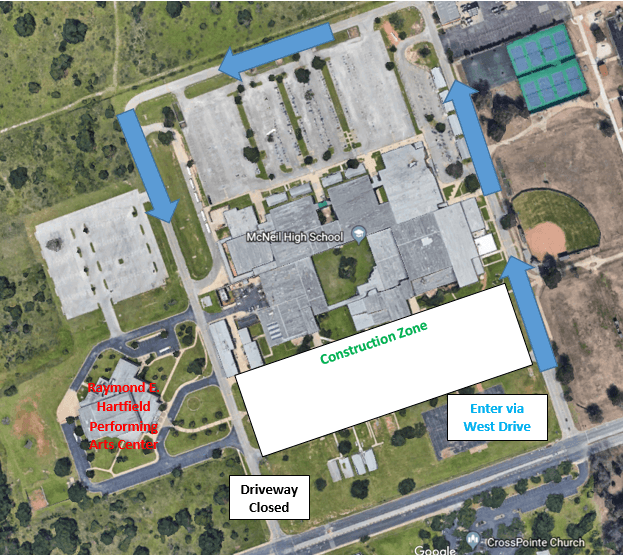 As construction continues at McNeil High School, the west driveway will be closed to traffic on Saturday, Nov. 3rd and Sunday, Nov. 4th due to construction work crossing the driveway. Patrons of the Raymond E. Hartfield Performing Arts Center arriving and departing from the Round Rock ISD Middle School One-Act Play Festival will use the west driveway closest to the baseball fields off McNeil Drive. Thank you for your cooperation and continued support of the McNeil Master Plan.